Talk about Letting Go of Stuff! It all began with a decision that was grounded in emotion. I wanted to keep my parent’s house in the family. My two brothers and sister had neither the time, not the inclination to keep it. So, quite simply, I bought them out. The sale happened in July 2004. I moved into the house around September of that same year. Now all the time I was negotiating the sale with them, I was focused on one thing – keeping the house in our family. After all, at the time, I felt strongly that it represented my parent’s dreams and hard work. So there I was, in this 4300 square foot home, surrounded by wonderful memories, warm and fuzzy feelings, grounded in love, and full of excitement. It also had damaged and rotted out balconies, leaky gutters, thirty-five year old shag carpet, and three bathrooms in which the showers and tub needed gutting out. And this list covers only a few items that needed attention. Each of the bedrooms were absolutely filled to the brim (so to speak) with stuff; but I had a plan. It was to start with the big stuff, and eventually make my way down to the little bitty papers, books, and other stuff. Here is how I did it. First, I contacted my siblings and gave them a date to come and get what they wanted. Next I opened the house to friends and others who wanted to take advantage of the free stuff. Next, I rented large dumpsters and threw away broken furniture, boxes, trash, and other items. Then I hired someone to come in and gut out the showers and tub, and to replace a couple of the toilets. Everything was moving along well – until – I got to my Dad’s office. That is when, what I had been feeling in my gut during this process, came to the surface; and I got stuck. Not only did I get stuck, but I had a physiological reaction to the process and got very sick. Here is where I got stuck. When I began to go through my Dad’s papers, hand written notes, letters to associates, pictures of family, and the tens of boxes in his office, the emotion of his passing emerged. I then began to attach the emotions of love and endearment to every letter, every hand written note (even though I couldn’t read the writing), and to every little trinket in his office. My logic was that “someone may need this…” and that logic allowed me to hold on to it. So I did. I stayed stuck for weeks. Then I got depressed, because I was stuck and couldn’t seem to figure out how to get “unstuck.” Once I got stuck on one thing, it snow balled. I then began to hold on to his clothing, his shoes, and other stuff as well. Then I wanted to hold on to broken furniture, that my Dad never got around to fixing. Eventually, the house began to (at least in my mind) get clogged up again with stuff. I began to get frustrated with myself, and that affected my ability to deal with my business and other aspects of my life. Something had to change. Then one day, a friend came by to visit the house. While walking around and looking at all the stuff, I shared with her that I was stuck. She looked at me and said, “Darren, I know a guy who wrote this book that may help you. It is called Letting Go of Stuff®.” Then she laughed and left. I was shocked that she had the audacity to hint at the fact that I needed to let go. But then again, she was correct. I was stuck and needed to apply my own philosophy. So I did. The first step (I call it a secret) was for me to acknowledge being stuck, and explore why. Without acknowledging however, I could not have been prepared to explore the reasons why. Acknowledging is the first secret to Letting Go of Stuff®. This step sounds simple, but you may be surprised at how many people are in denial of needing to change. That is why; this is the most important step. Until I am ready to acknowledge I need to change something, I won’t. My friends and family can tell me I need to change. They can even have interventions to assist. But until I am ready to accept and acknowledge it, it won’t happen. The second secret is to realize that I would go through changes in trying to make the change. We often tend to naturally resist change. When we attempt to change something about ourselves, we sometimes become our own internal change resistor. Claiming change, yet unconsciously resisting it can keep you in this two steps forward, two steps back dance with your self. The third secret is to manage and listen to your internal conversation. We all talk to ourselves. I believe the internal conversation is the most believed of all conversations. So it is easy to convince yourself that you don’t need to change, or let go of something, because you believe what you say – to you. Paying attention to that conversation is critical. Becoming consciously aware of what you say to your self is powerful in that it will allow you to begin to change that conversation into what you want. Especially since you believe everything you say, to you. Think about it. These are three of seven secrets that will assist one in getting “unstuck.” They certainly helped me to clean out my parent’s home. Which by the way, is on the market today. I know, I went on and on about keeping it in the family and all of that. But hey, what can I say. It was my parents dream home not mine. We do have a dream for our daughter’s future. It is that she remains healthy, makes great choices for her life, is happy, and that she honor her parent’s memory in any way she sees fit. The same way I have done for mine. Selling the house is my way of closing the chapter on this phase of my life. I will start a new chapter knowing that I did everything I could to enable the house being sold with dignity and grace. That, to me, is honoring my parents. Though it is really for me, it makes me feel better that in my heart; I am honoring their memory. That is a big part of what Letting Go of Stuff® is all about; doing what you can to influence a situation by focusing only on what you can control, then choosing to move on with dignity and grace. That is the sixth secret to Letting Go of Stuff®. This entry was posted in DeClutter and tagged darren l johnson, happiness, Letting Go, letting go of stuff, lifestyle, Parenting. Bookmark the permalink. Hi Florida. Thanks for visiting the blog. Sorry about the lag in posts. But you should subscribe to the blog anyways. The subscribe link is in the bottom right corner of the page. As for your situation. I think it is great that you met with a realtor. BUT, I would not sell the house just yet; unless your Mom says she is okay with it. As long as she is around – its her house, not yours. So hold off on selling it for now. In the stead, go through the house and begin the process of cleaning it out. Read my ARTICLE that offers the steps I used to clean out my parent’s home, after they were both deceased. Allow yourself to experience the feelings that will emerge as you go through all the STUFF in the house. Face it. Don’t run from it by selling the house. If you do, then you will not be able to put closure on this phase of your life. Finally, as you go through the house, take certain items you find to your Mom when you visit her. Talk about the found memories that emerge from it. Take to her the things that gave you joy as a child and tell her how you feel and how you felt then. In other words, don’t sell the house until you have allowed yourself to fully experience this phase of your life. This is not a decision you want to rush in to. It is one you want to take your time with. This advice is not meant to replace therapy or any other type of professional advice you may be receiving, or may have received in the past. 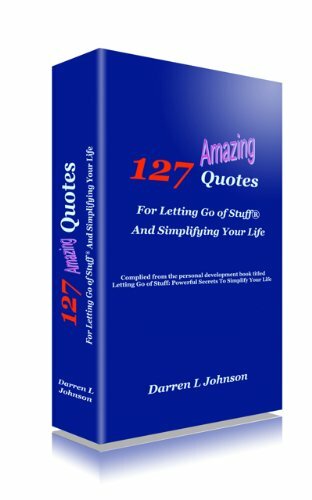 This advice is based only on the book titled, Letting Go of Stuff by Darren L Johnson. Wishing your ALL the best with your situation. Please come back and let me know what you think and what you decide to do. Wow! Both your parents were awesome in their own right. Below are a few suggestions/steps along with clarifying questions. Have you spoken to your partner about how you feel? Can your partner help in any way? Do you have siblings who might be interested in helping out? Ok.Even though I don’t have much more to go on, let me suggest the following steps. 1-walk through apartment, with your partner, and identify the items you would keep if you knew the place were about to burn down. Have your partner take each of items you identify – out of the apartment. 2-pick a specific date that you will open the apartment to friends and family. Have then come by on that date and pick out what ever they want – from what is left after you have done number 1 above. 3-after you have successfully accomplished 1 and 2 above, then have an estate sale with the things that are left in the apartment. 4-what ever is left after the sale – then give the rest away to a charitable organization. Once the apartment is empty, then you will know whether or not you should sell or rent the apartment. Along the way – follow your inner spirit as you make your decisions about the apartment. Finally, as a PS – you might need to be absent from the apartment when you do number’s 2 and 3, and perhaps 4. Of course you will need to be tuned in to how you are feeling along the way to make that determination. Remember – only begin the above process when, in you hear of hearts, you are ready to do so. Hope this helps in some way Mia. KEEP US INFORMED by coming back to the Letting Go Cafe. The above information is provided not as therapy or advice, but merely to offer an alternative way of approaching a specific situation. This information in no way replaces any counseling, therapy, or other professional alternatives sought and used by the visitor of the Letting Go Cafe. Loved the article. Your point of one sacred item turning into many is so true when we don’t stick with our initial conversation with ourself which was to let go. Hi Sharon. Thanks for your comments and for visiting the cafe. Please share with your online buddies and family about the Letting Go Cafe. @Sharon. Thanks for your comments. Please let me share with you our 2012 In Review report. Its pretty amazing considering we don’t market or advertise this blog site. Happy New Year! Hi Val. Thanks for your comment. What kind of stuff do you need to get rid of? What is your plan for doing go? Please as it might help others who read the blog. Looking forward to hearing from you about it all. Take care.